What if it Wasn't Love? John Kim (The Angry Therapist) is doing things differently. Therapy in a shotglass. Ten minutes, no filler. The Angry Therapist Podcast is Produced and Audio Engineered by Amanda Meyncke, with support from Stephanie Zoccatelli. Music in this episode is by Keshco. Want a free relationship toolkit to improve your relationships and yourself? Sign up here theangrytherapist.com/podcast. Want to change your own life, give back to others and change the way others experience the world? Let's talk. Become a life coach. Get 7 days free with BLINKIST --> https://www.blinkist.com/angry 3,000+ bestselling nonfiction books, transformed into potent little packs you can listen to or read in just 15 minutes. Music in this episode is by Keshco, used under a creative commons license. The Angry Therapist Podcast is Produced and Audio Engineered by Amanda Meyncke, with support from Stephanie Zoccatelli. Order John's book, "I Used to Be a Miserable F*ck" out now! BLUECHEW Promo Code: BlueChew is a service dedicated to bringing prescription treatments for men who don't like pills, do not want to go to the doctor’s office, and want to have more confidence in bed. ---> https://bluechew.com Use Promo Code ANGRY and pay only $5 dollars shipping to try this product for free. Music in this episode is by Keshco, used under a creative commons license. The Angry Therapist Podcast is Produced and Audio Engineered by Amanda Meyncke, with production support and design from Stephanie Zoccatelli. Get 50$ off your first Greenchef order! --> http://greenchef.us/angrytherapist -- THE #1 MEAL KIT FOR EATING WELL -- Now offering a variety of easy-to-follow meal plans for every lifestyle, like keto, paleo, vegan, and more. Episode 158: Where Are You Pulling From? Order John's book, out now! Episode 154: The Power in New Experiences + My Book is Out! PRE-ORDER John Kim's new book here! Episode 145: What is a Beautiful Person? 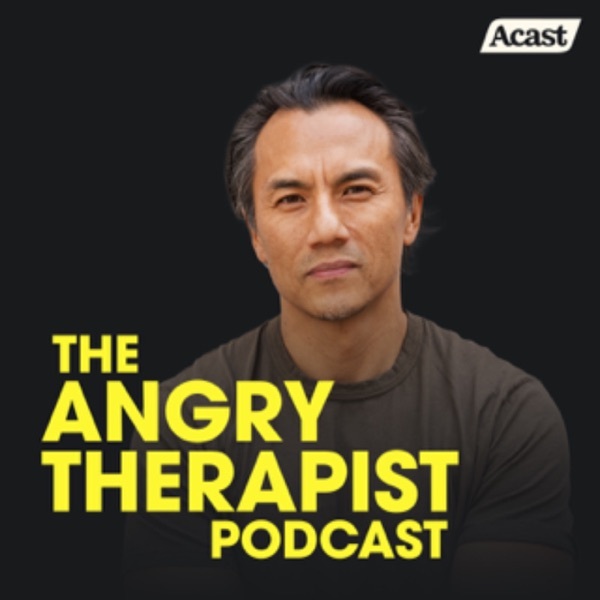 John Kim (The Angry Therapist) is doing things differently. Therapy in a shot glass. Ten minutes, no filler. Episode 133: The Miserable F-ck Documentary and Book Tour! Episode 126: Does Your Relationship Have a Chance? Want to become a life coach? Check it out here. Music in this episode is by Keshco, used under a creative commons license. The Angry Therapist Podcast is Produced and Audio Engineered by Amanda Meyncke, with support by Stephanie Zoccatelli. Episode 118: What's Your Spin? Music in this episode is by Keshco, used under a creative commons license. The Angry Therapist Podcast is Produced and Audio Engineered by Amanda Meyncke. Episode 114: TAT Book Club! Episode 108: What's At Stake? Episode 106: Who Are You Doing It For? Episode 100: My 100th Episode! John Kim (The Angry Therapist) is doing things differently. Therapy in a shotglass. Ten minutes, no filter. Episode 85: Where's Your Fork? Episode 66: How Do You Know When to Love Someone? Episode 65: Let's Bring Kissing Back! Episode 56: What if It Wasn't Love? In this episode, John believes anything is possible, and that applies to you too! In this episode, John goes extra long, deep diving on how to be productive AF. Want to help others live fuller, richer lives? Check it out here. In this episode, John talks self esteem and all the ways to build it up! In this episode, John explains how to get what you want by letting go of it. Don't worry, he'll explain. In this episode, John explores what a defining moment looks like. In this episode, John goes deep on his first therapy session in a long time. In this episode, John goes on a journey on the topic of what Dr. Dre, Tattoos and Compassion all have to do with one another. In this episode, John talks about one of the lessons of love. Number #34, of course. In this episode, John explores all things love, relationships and more. Bonus long episode! In this episode, John explores how to apologize, truly and sincerely. In this episode, John discusses what it means to be "the basement guy". In this episode, John processing intermittent fasting and his dating life. In this episode, John talks a different perspective on Valentines Day. In this episode, John writes a letter to his future self. Hopes, dreams and all. In this episode, John gives us a look at the most important relationship factors and how to create them. Episode 31: What is "The Work"? In this episode, John goes deep on what the work is and how to do the work. In this episode, John walks through his feelings and what it all means. Episode 29: Stop Sending D**k Pics! In this episode, John talks about showing yourself, your whole self and nothing but yourself, but NOT in THAT way! In this episode, John talks about the mechanics of changing your thoughts. In this episode, John talks about his changing definition of beauty. In this episode, John talks about the seven basic human needs. In this episode, John talks about going beyond the standard self help tools. In this episode, John talks about the power of a fixed vs. growth mindset. In this episode, John talks about how to redefine making a dent in the universe. In this episode, John talks about the one thing men need to say more. In this episode, John talks about setting intentions and moving powerfully into 2018! In this episode, John talks about how to see inside people, past their a-hole exteriors. In this episode, John talks about Christmas and surviving the holidays. In this episode, John talks relationship and marriage advice. In this episode, John goes on a walk and talk, Sorkin-style and discusses love. In this episode, John talks about the power of curiosity. In this episode, John talks about living a spiritfilled life. In this episode, John talks about what actually makes you a man. In this episode, John talks about dissolving your fear of love. In this episode, John divulges the 43 things about himself he wants you to know. In this episode, John talks internal momentum. In this episode, John relates how to live inside out, instead of outside in. In this episode, John talks specifics on getting over a breakup in a powerful way. In this episode, John talks the the pivotal and life changing power of your story. In this episode, John wraps up his four part series on building a strong container. In this episode, John talks the importance of attracting vs. chasing and what that looks like in daily life. Episode 2: Finding Your Stance. In this episode, John talks the importance of having a strong stance, and what that looks like. Episode 1: Everything Starts with Soil. In this episode, John talks soil for growth, transparency and containers.